Designed for industrial-strength printing. Our new 6920 and 6935 continuous forms laser (CFL) printers combine the print quality and speed of laser technology with the advantages of continuous forms. Run your big print jobs unattended with complete confidence. Their inherent flexibility in handling forms from 7 to 17.5 inches wide and pinpoint accurate registration make the 6920/35 ideal for a wide variety of applications. Add superior reliability, outstanding support, and midrange systems expertise and you have an incredible, cost effective printing solution. Models 6920/35 Continuous Forms Laser Printers The 6920/35 provide unusually sharp print images on a wide range of fan-folded materials including data processing reports, invoices, and custom labels. DD 6920 and 6935 printers offer extraordinary flexibility when it comes to forms size. They can handle forms from 7 inches to 17.5 inches wide and from 1 inch to 99 inches long. Moreover, 6920 and 6935 continuous forms are physically compatible with those used by line printers. The 6920/35 printers provide unusually sharp print images on a wide range of fan-folded materials including data processing reports, invoices, and custom labels. Automatic job separation, combined with an optional power stacker, ensures unattended printing as well as zero forms waste. Run large print jobs unattended with assurance. A straight-through paper path combined with the power stacker option enables printing and stacking of an entire box of continuous forms without supervision or intervention. 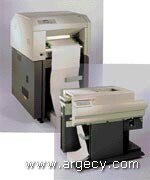 DD 6920/35 CFL printers include a flash fusing imaging system that handles a very wide range of paper and label stock, including plastic cards and other synthetics. This Flash Fusing technology uses neither heat nor pressure to fuse its toner. Customers can use the 6920 or 6935 for a wide variety of applications - from mailing labels for printing and publishing to drum labels for chemicals, from window stickers for automobiles to shipping and hanging labels for apparel, from shelf labels in grocery stores to mylar product labels for appliances and customer statements and bills for banks or utilities. The list is only limited by a user's imagination. Applications with tight registration requirements are a natural for our CFL printers. The precision pin feed drive design offers superior accuracy. With the 6920 or 6935, continuous forms are always in the exact right position for printing each and every time. This makes applications that demand precise print placement and no paper skewing perfect for these accurate printers. The 6920 and 6935 are compatible with existing forms for smooth operation. Existing applications can be used with little or no program changes. In fact, these printers are at home in almost any IBM computing environment - from AS/400 Twinax to networks and client/server to mainframe Coax. In addition, our CFL printers include PSA (Printronix System Architecture). PSA enables any print application to operate on a plug and play basis across all DD CFL printers, DD and IBM line printers, or any Printronix printer. They are designed to permit the migration of applications among print technologies - line matrix, laser, or thermal transfer. These features along with their versatility make our CFL printers a very wise investment, offering protection should your business or printing needs change. These printers support industry standard printing languages such as Printronix Graphics Language (IGP/PGL), Code V (IGP/VGL), Printronix LinePrinter Plus, IPDS, and PCL5. This language support makes it easy to develop and run printing applications to meet most needs. Moreover, these printers are specially designed to take advantage of the Windows environment. Special Windows print drivers deliver top performance from these printers. The result - our 6920/35 products bring industrial strength printing to Windows applications with ease. The 6920 is an industrial strength continuous forms laser printer which can handle continuous forms up to 17.5 inches wide with extraordinary ease at up to 20 pages per minute (PPM). The 6920 provides unusually sharp print images on a wide range of fan-folded materials including data processing reports, invoices, and custom labels. Automatic job separation, combined with an optional power stacker, ensures unattended printing as well as zero forms waste. The 6935 is a top-of-the line CFL with extraordinary print quality which can handle continuous forms up to 17.5 inches wide with extraordinary ease at up to 35 pages per minute (PPM). It's optional cut sheet feature even enables on-the-fly switching between cut sheet and continuous forms printing under host computer control. Automatic job separation, combined with our intelligent power stacker, ensures zero forms waste on documents like checks, invoices, and custom labels. The 6935 uses a unique 2-step fusing process. As the media passes through, its pores are opened by the warmth of halogen lamps. Next, as the toner is distributed onto the media, it is permanently bonded as Xenon lamps melt the toner deep into the pores of the media well eneath the surface. Continuous Forms One part, tractor feed Min/max form width 7" to 16" 7" to 16" Optional max.width 17.5" 17.5" Min/max form width 7" to 16" 7" to 16" Optional max.width 17.5" 17.5"
Printable Area Print line length 6" to 14.7" 6" to 14.6"
Power stacker paper length 7" to 12" 7" to 12"
Max. Altitude 7500 Ft. 7500 Ft.
Dimensions Printer Only Height 48" Width 30" Depth 34" Height 47.5" Width 50.6" Depth 36.8"
Printer with Stacker Height 48" Width 30" Depth 42" Height 47.5" Width 50.6" Depth 36.8"